One day I will get a book for review written by a respected colleague, a lifetime friend and a known authority, which then gets a damning review. Fortunately, that is not the case here. After John Watkinson sent in his review (he is one of my most reliable contributors, and I also extend my thanks to the other two, who shall remain nameless), I thought it worth seeking the author’s view of why the publication was necessary and what novelty it carried. I have great respect for those who undertake surgery in the parotid. That facial nerve seems so much safer and easily found in the ear. Why was this book needed? It started following my appointment as Series Editor of Advances in Oto-Rhino-Laryngology, published by S Karger, Basel, Switzerland, and I was encouraged to commission two to three volumes per year commencing with volume 78. This publication produced its first volumes in the 1960s, and aims to allow subspecialties within the field of ENT to air their clinical and research interests. Salivary gland neoplasia has been an especial interest of mine since before being appointed as consultant head and neck oncological surgeon at Nottingham University Hospital. I was a founding member of the European Salivary Gland Society, and was its second president – this allowed me to develop friendships with many of the salivary gland experts worldwide. Salivary gland neoplasia has shown a major increase of research in areas such as pathological classification, molecular and genetic markers, improved imaging, and the potential application of novel therapies for advanced primary epithelial salivary gland neoplasms. The current progress and published literature can be found and read in numerous scientific and clinical research journals, most of which are unknown to clinicians. Therefore, having discussed the project with Professor David Eisele, who is well known as a ‘salivary gland expert’, we had a starting point; it was my idea that we should concentrate on ‘advances’ and not reproduce a ‘chapter for a textbook’. I also felt that it would be an idea to get two ‘experts’, preferably from Europe and the USA, to jointly contribute to each chapter, demonstrating that there is agreement on the ideas and content of what would be ‘short chapters’, well tabled and referenced. 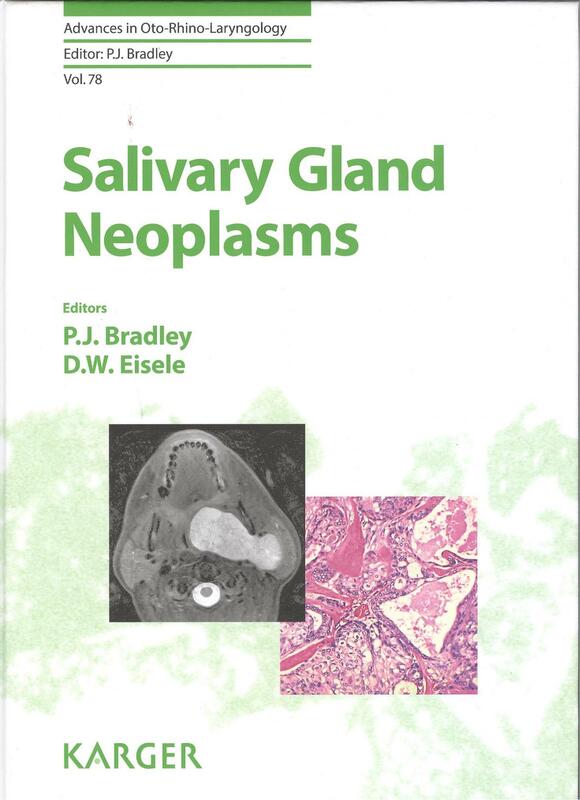 After reading this volume, most readers will require reprogramming on what they learnt during their residency about salivary gland neoplasms, and what is known now and into the future! All salivary gland neoplasms, whatever their histopathological label and increasingly recognised wide spectrum of cellular activity, are better represented as ‘overlapping rings’, which the modern pathologist is expected to report. The clinicians must then act and initiate ‘personalised care’ for each and every patient diagnosed with salivary gland neoplasms. This book represents volume 78 in the Advances of Oto-Rhino-Laryngology series. The two distinguished volume editors (Professors Patrick Bradley and David Eisele) have assembled a notable list of contributing authors to cover this rare but very important topic in a single text. Each one of the 23 chapters is concisely written by a world-renowned expert. The chapters are concise, relevant and well-illustrated, with some having colour photographs. All topics are well covered. I was pleased to see that the classification chapter was completely up to date and well written, as were the chapters on quality of life and palliative care. All subjects are addressed, from adults to children, covering benign and malignant disease, as well as surgical and reconstructive techniques, together with adjuvant therapy including irradiation, and both chemotherapy and targeted therapy. The book concludes where it began, with the two editors taking an educated view as to what the future may hold. In summary, this concise, one-volume update will be invaluable both to those in training and those already treating patients with this rare and challenging disease.